Seattle tours are available to passengers with afternoon flights or an overnight stay in Seattle after their cruise. Home of the world-famous flying fish, Pike Place Market is the oldest open-air farmer's market on the West Coast and boasts hundreds of artisans, local farmers, fishmongers and curio shops in a vibrant atmosphere. 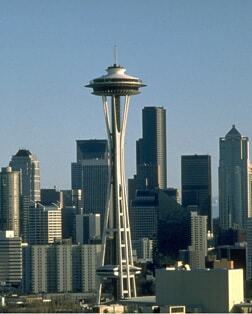 The Space Needle, a futuristic fixture of the Seattle skyline, was built for the 1962 World's Fair. Spectacular panoramic views of the Emerald City's natural beauty abound from its 520-foot high observation deck. Seattle's oldest neighborhood is a 17-square-block National Historic District located in the southwest corner of downtown. Rebuilt after the Great Fire of 1889, beautifully restored architectural masterpieces can be found around every corner. Woodinville, less than 30 minutes from downtown Seattle, boasts over 100 wineries. Choose from the friendly tasting rooms and many tours, including the famed Columbia Winery and Chateau Ste Michelle. This facility offers the only opportunity to tour a commercial jet assembly plant in North America and learn about the dynamics of flight, new aviation innovations and go behind the scenes at Boeing. Built in 1911 this complex of locks provides a link for sailboats, motorboats, tugs and barges between Puget Sound and the Ship Canal, which connects eastward to Lake Union and Lake Washington. One of the city's oldest neighborhoods, this multiethnic enclave is rich with history and culture. Highlights include delectable restaurants, unique specialty shops and diverse heritage sites. An urban gem and popular recreational spot close to downtown Seattle. Seaplanes, competitive rowboats and pleasure craft ply the waters and a series of parks and floating houseboats dot its shores.